For the first few miles out of Nome, the Teller Highway heads towards two peaks: Anvil Mountain to the left and Newton Peak to the right. Named for the anvil-shaped rock formation on the western side of the summit, Anvil Mountain is best known for the Cold War era site that looms from its eastern summit, part of a statewide communications system known by the code name “White Alice.” The four giant box-like antennas, which served to receive and transmit low-frequency microwave radio communications, were built to provide reliable communications to far-flung, isolated, and often rugged locales and to connect remote Air Force facilities with command centers in Alaska. The system became obsolete with the advent of satellite communications in the 1970s and was deactivated. As recently as 2010, discussions were underway to decide to keep or demolish the Cold War icons as a part of environmental clean-up of de-commissioned military sites. 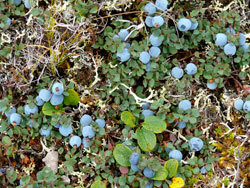 Access to dwarf alpine habitat on summit of Anvil Mountain is possible by a gravel side road that originates from the Dexter Bypass Road (see Mile 2.8), however, the land is property of Sitnasuak Native Corporation so please follow their posted rules. At the top of the mountain there are sweeping views of the area and an assemblage of species not found at lower elevations. In spring the Kamchatka rhododendron and other dwarf tundra flowers produce a stunning carpet of color across the rocky surface. In most seasons muskoxen groups are found on the flanks or top of the mountain making this a reliable place to get comparative views of bulls, cows and calves at relatively close distances from the road. Birdlife includes species that favor lichen covered rocks, dwarf prostrate willows and other attributes of the alpine zone. Muskoxen usually frequent this area, look for young calves in early May. Reindeer from privately owned domestic herds are often close to town at fawning time in late April and May. Do not confuse these animals with caribou, which are not known to migrate into these areas. Red fox are frequently seen scavenging on dead fawns. Grizzly and wolf are occasionally attracted to an easy meal at fawning time, especially at twilight. American golden-plover, horned lark, northern wheatear, American pipit, red-throtated pipit, rock ptarmigan are species found in high, dry, dwarf habitat. Common raven use Anvil Mountain antenna structures to support their nests. American wigeon, northern pintail, green-wing teal, and red-necked phalarope are frequently seen in small grass edged ponds. Open only in summer, the five-mile long Dexter Bypass Road links Teller Highway and Kougarok Road and offers additional opportunities for muskox viewing. The access to Anvil Mountain is on the left, a couple miles from the Teller Road. After the summit of the by-pass road, notice the horizontal lines running across the distant slope: remnants of old ditch lines that carried water to Nome’s mining operations and the bed of the old railroad line. The road ends across from the small community of Dexter on the Kougarok Road, where you can turn right and follow the Nome River and sandy coastline back to town or turn left and head north for Salmon Lake and points beyond. 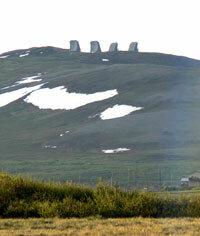 The road crosses Anvil Creek one mile below the site of the 1898 gold discovery that triggered the Nome gold rush. From here you can also view the wind turbines that form the start of Nome’s efforts to harvest wind as an alternative energy source. Glacier Creek Road runs approximately 30 miles up the east side of the Snake River. It becomes a rough four-wheel-drive road after the first three miles where it passes the Rock Creek Mine site, and is not maintained in winter. Along Teller Highway, look north up the valley on a clear day and you will see the pyramid-shaped peak of Mount Osborn. At 4,714 feet, it’s the tallest peak on the Seward Peninsula. The small lakes on either side of the road become ice-free earlier in spring than large lakes, offering waterbirds nesting areas close to coastal feeding areas. Tundra swan, Canada goose, American wigeon, northern shoveler, northern pintail, green-wing teal, greater and lesser scaup, red-breasted merganser, red-throated loon, Pacific loon, red-necked phalarope, glaucous gull, mew gull may be seen in the small lakes and ponds. Rusty blackbird often appears in the shrubby edges of wet meadows in this area. The Snake River has a relatively short drainage that flows from the south side of the Kigluaik Mountains. The bridge crossing is typical of the wide vegetated valley that has tall dense willows adjacent to a narrow swift flowing river. The broad riparian habitat zone supports some of the highest densities of moose along the Nome road system. The lower river becomes more lazy and offers the option of a short day-long raft or boat trip downstream to take-out locations close to the airport or harbor. In winter, the road is not maintained beyond the bridge and is typically impassible due to deep snowdrifts. However, a walk, ski, or snowmachine ride along the Snake River Valley may reveal the tracks of moose, ptarmigan, red fox, snowshoe hare, mink, river otter, and beaver in the snow. Moose are found in high numbers in the heavily willowed Snake River valley. Ptarmigan, as mixed flocks, remain in willowed areas in winter. Northern harrier hunts for songbirds and small rodents where tundra meadows meet the hillside willows. 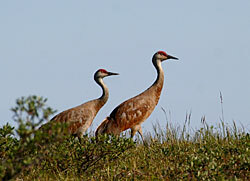 Sandhill crane migrate in large, noisy groups heading north in May and south in September. Some remain and nest in nearby coastal meadows. Arctic tern hover and divesfor small fish. Cliff swallow appear from under-bridge nesting sites and tree swallow from nearby nestboxes. Yellow warbler and less common Wilson’s warbler flit through willow thickets. Arctic grayling and Dolly Varden also are found in these waters.